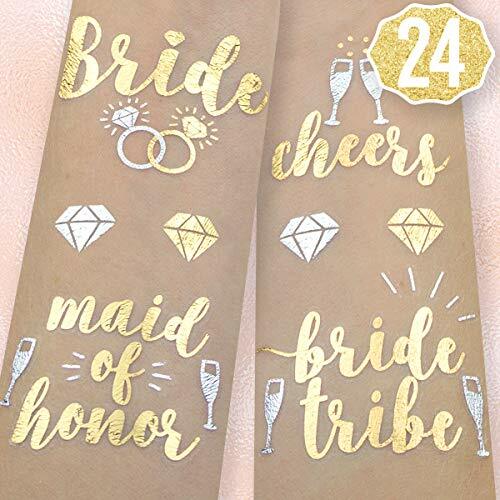 Bachelorette Tattoos For The Whole Party: two sheets with a total of 24 metallic flash tattoos featuring a unique design for the bride, maid of honor + her entire bride tribe with super cute additional diamond, engagement ring + champagne glass styles to get the party started! 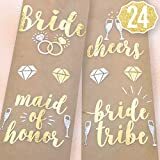 Long Lasting: these gold and silver flash tattoos have been put through rigourous party testing and are 100% guaranteed to last day into night - the perfect bachelorette decorations for the bride to be! The Perfect Party Accessory: a fun addition to any bachelorette party or bridal shower decorations! Each sheet measures 8.25 " x 6 " creating the perfect size tattoos! Bachelorette + Bridal Shower Ready: the perfect accessory for an engagement party, a night out in Vegas or even a pool party in Cabo - our tattoos will act as the perfect bridal accessory!